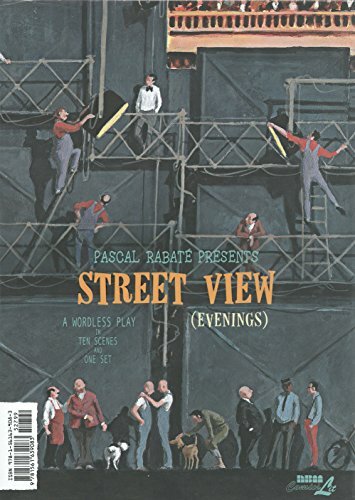 Street View by Pascal Rabate is a comic book that presents a theatric play. The presentation however is unlike typical comic books with panels and dialogue. Street View only has one set, the facade of European style buildings. In the buildings and on the streets are the characters going about with their daily routine. What's interesting is the play with time. You get to see what happens on the street and characters as time passes from morning to the evening and nighttime. Ten scenes happen from the morning and ten at night. You can follow the activity in each apartment, or follow what a character is doing. There are mundane moments like a lady who watches TV all day, and more cheeky moments between couples. I shall not mention too many as spoilers but the fun is to discover them yourself. It's also like a game of spotting the difference. I find myself going back and forth to see what has changed during each timing, sometimes to understand the story, or to see the relationships characters have with one another. One unusual thing about the book is its physical presentation. It's a hardcover book with accordion pages. You can flip through the scenes easily, or stretch out all the ten scenes and look at them all at the time same. It has a nice cover art that shows the back of the buildings, as if it's a real set, with actors getting in position before acting. Overall, it's an interesting comic worth checking out.